Hop in the driver seat for some extreme go-kart racing where bumping is most definitely allowed. Race on FIVE incredible tracks from beach-side speedways to airport runways and other no-go zones. Hug the turns or veer off-road as you play chicken through figure-eights and crash on through to first place! A kart racing experience like no other – Small Wheels combines the fast pace of arcade-based racers, the rigor and precision of simulation-based titles and the action elements of kart-racing games for a uniquely compelling, “fun-sized” experience. 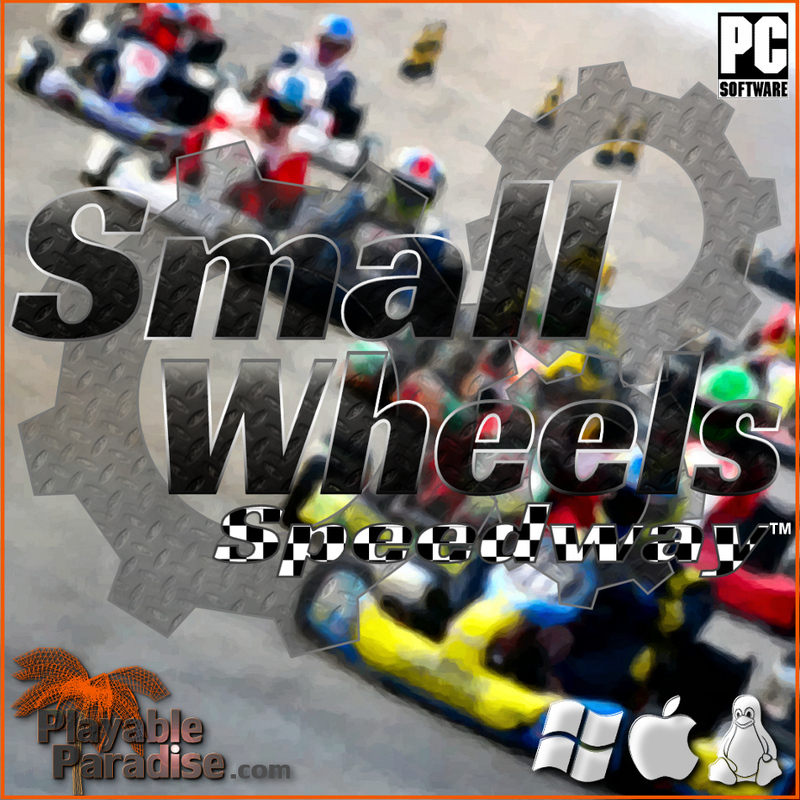 Unlike traditional kart racers, Small Wheels features sophisticated kart physics and driving mechanics modeled across SEVENTEEN distinct elements. Like your true life counterparts, drivers must use proper cornering and braking techniques – reducing speed to take turns, accelerating cautiously on slippery terrains, and cutting corners to save seconds and advance! Tracks are painstakingly modeled to complement advanced kart physics with varying terrain types, conditions, elevation and theme-appropriate hazards to avoid. Within each track wait four racing modes, including traditional circuit, time-trial, speed-trap and knock-out modes, where you'll be ranked in sheer speed and the last to finish are eliminated. Including engine torque, transmission, car suspension, damping, acceleration, braking, aerodynamics, terrain friction, wheel traction, mass, gravity and more! Race through action-packed tracks ranging from beautiful beach-side tracks to airport runways and other no-go zones! Including FOUR racing modes: traditional circuit, knock-out, time-trials, speed-traps and a fun-sized demolition derby. Download new karts and tracks or try your hand at creating your own. Duel it out with up to EIGHT players per track in the next best thing to a Saturday afternoon at your local racetrack. Chose from multiple camera angles, including 1st and 3rd person views. Upload your own music collection as an in-game soundtrack. © 2014-2018 Playable Paradise, All Rights Reserved. To promote Small Wheels Speedway™ and grow its popularity (top games), use the embed code provided on your homepage, blog, forums and elsewhere you desire. Or try our widget. OCR is an open-world indie driving game powered by Unreal Engine 3 featuring a free roam, time-trial and a race mode on a massive environment for $4.99. A dynamic soft-body physics vehicle simulator capable of doing just about anything.